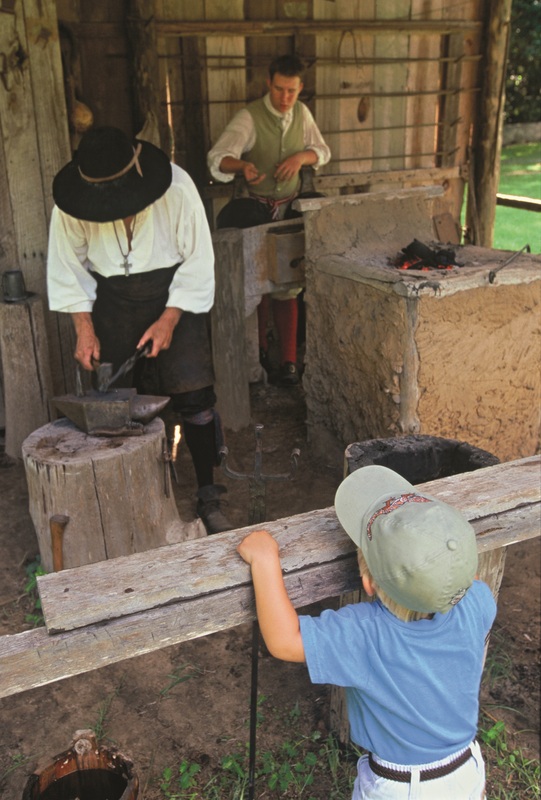 A young boy watches blacksmiths working at a forge at Mission San Luis in Leon County, Florida. The Mission was awarded a Preserve America Presidential Award for heritage tourism in 2006. 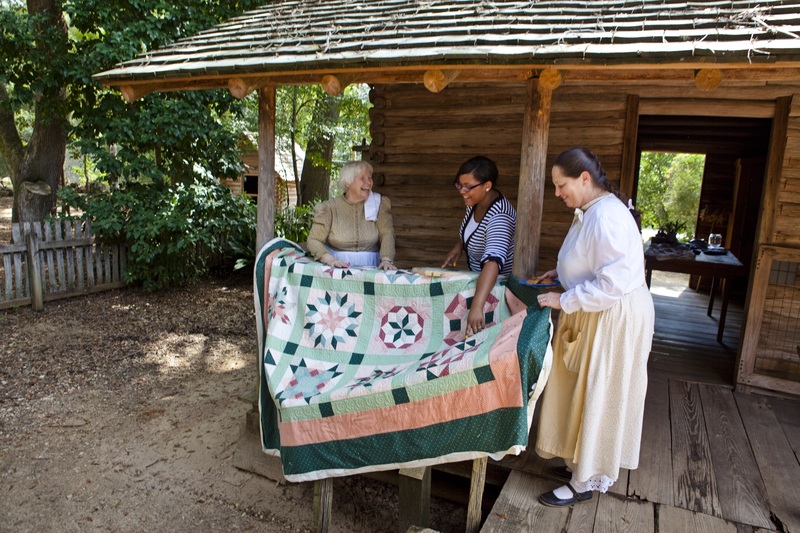 Living history interpreters show a visitor a completed quilt at the Tallahassee Museum of Natural History and Science. Leon County, Florida, (population 272,896), named after Spanish explorer Ponce de Leon, is located in the Red Hills of northern Florida. The area has a long and rich history of human settlement. Apalachee Indians settled in the area before the 1500s, followed by Spanish and English encampments and large-scale antebellum plantations, all preceding Florida’s transition to statehood in 1845. Leon County is home to Florida’s capital city of Tallahassee, as well as several historic crossroads communities such as Miccosukee, Chaires, and Bradfordville. The county’s impressive archaeological sites include the tallest Native American ceremonial mound in the state, in the Letchworth-Love Mounds Archaeological State Park; the site of de Soto’s winter Florida encampment and the Apalachee village Anhaica, near the historic Governor Martin House in Tallahassee; and the Lake Jackson Mounds Archaeological State Park, also a notable Apalachee site. Mission San Luis, one of the first National Historic Landmarks to be designated (1960) was the Spanish colony of La Florida’s largest and most successful mission community, as well its western capital during the 17th century. Located in present day Tallahassee, the Mission was awarded a Preserve America Presidential Award for heritage tourism in 2006. A new visitors’ center opened in December 2009, following a year of archaeological research that located the remains of two additional mission buildings. Since the opening, visitation is up over 100 percent, with guests from 44 states and 13 countries, as well as school groups from 27 Florida counties. Leon County also boasts many other National Register of Historic Places-listed properties, including the Bannerman Plantation, the Billingsley Farm, and the Roberts Farm – all large rural properties with multiple historic structures. Natural Bridge, the site of a Civil War battle, is also in the county. Historic Maclay Gardens in northeast Tallahassee is renowned for its beautiful blooming displays and historic house. The grounds of Pisgah United Methodist Church (1858) and the Tall Timbers Plantation are also open to visitors. The county, in conjunction with the city of Tallahassee, qualified for Certified Local Government (CLG) status in 1987, and has had a historic preservation element in its comprehensive plan since 1991. Also in 1991, the Canopy Roads Citizens’ Committee was established. Leon County is well known for its historic and beautiful canopy roads, which radiate out from the center of Tallahassee to the edges of the county. This body promotes the preservation and appropriate maintenance of the historic roadways and trees. Several driving tour brochures guide visitors to historic sites all over the county, including the canopy roads, sites related to African American history, historic cemeteries, and historic churches. These tour brochures are available at Visit Tallahassee, the Tallahassee Trust for Historic Preservation, and the John G. Riley House Museum, constructed in 1890 in the historic African American community of Smokey Hollow, and now an African American heritage center. Planning is now underway for marking the 500th anniversary of Ponce de Leon’s 1513 exploration and naming of La Florida.